One of the most common questions we receive about plants on the nursery is the ultimate ‘is it hardy’ – and after three severe winters of uncertain and prolonged weather you may believe this to be a just question. However in my opinion I start to wonder when we became such demanding gardeners? We sadly now disregard many beautiful plants with a variety of characteristics simply to acquire the toughest, most reliable hardy cultivars. It’s like being content with the simple cabbage because asparagus and all its delights are just too much effort and expense. Each winter I see many winter pansies easily walking out of garden centres followed by the multi-coloured primroses and other hideous annual bedding plants – all of them to be lovingly displayed in pots and look attractive for maybe one week, two if you’re lucky, only then to droop become straggly and unsightly, require constant deadheading and then to be ripped out and hurled to the compost. The worst of these has to be the winter pansy which no more flourishes in winter than an Englishman’s pasty legs! Preferring to wait until you’ve almost given up on them and then thrive and prolifically flower in June. So why I ask are we wasting our precious time and pounds on these plants but then easily dismissing perennials such as Salvia microphylla, Penstemon and Pelargoniums simply due to them requiring a little winter care but will reward you with flower and scent for at least four months of the year. Many of the shrubby Salvia will flower from May to November even December. All Salvia have highly sweet fragrant foliage and will hold their leaves in a mild winter – apart from S.uliginosa and S. patens as they are deciduous. They require full sun, well drained soil and need no deadheading. As for winter care we recommend not pruning them until spring, giving them a heavy mulch and plant early in the year so they can establish well before winter sets in. So why have sales in these stunning plants dropped in the past three years? Have they gone out of favour and fashion? Have they been preceded by better cultivars? Or is it simply that they are now labelled as ‘half hardy’? As a nurseryman and plant enthusiast those two words always put my teeth on edge – not because I fear something that needs a little care but because others seem to. 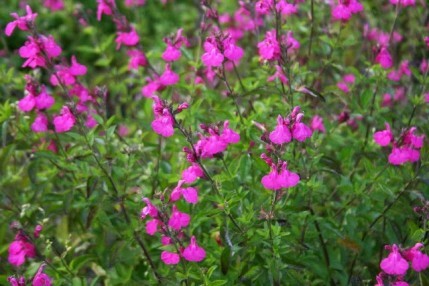 I have spoken to many Salvia specialists who have relayed their frustrations to me on discrimination against these plants – with customers regularly purchasing annual bedding but disregarding these wonderful perennials. As well as Salvia another perennial that has come into disrepute is the Penstemon. Like most genus there are many ghastly cultivars of this plant that most certainly should be disregarded – I wont name them as they are favoured by some but there are still some delicate cultivars worthy of any garden. Penstemon Blackbird is an elegant dark variety with tall spires of dark plum bell flowers. Penstemon Appleblossom has fine cut leaves and small pink flowers that easily complements other plants. With a long and lush flowering period, evergreen in a mild winter and a diverse colour range to choose from they can be a perfect perennial. Lastly, Pelargoniums – one of my favourite genus – they have everything you could want from a perennial apart from the stamina to withstand a frost. Pelargoniums scream ‘rip out your pots of horrendous bedding’ and you should. Throughout this genus your can have and variety of foliage shape, long flowering period from April- October, scent from peppermint to rose, drought tolerant, sun and shade loving, edible, and some hardy to -2/3 degrees. Some varieties reach just 20cm where others reach 300cm, some trail, some are highly floriferous, some have medicinal roots. Majority are easily propagated. All this can be achieved through careful overwintering – cut back and remove foliage in October, bring into a frost free but light environment in November and forget about them until February. Water a little every 2-3 weeks and remove dead leaves if you remember! If you are still dubious – purchase a Pelargonium tomentosum in April and see how your opinion will have changed by October. Maybe I am wrong and I would love to hear others opinions – my own view is bias towards the nursery trade of course but I honestly believe we are missing out on such treasures that are labelled half hardy or tender just due to fear of overwintering them or a simple lack of time. Be rash – try the asparagus and see what you’re sacrificing for simplicity.